Editor’s note: This story was originally published on UW Health Sciences NewsBeat. Chatting on the phone with a sleep coach and keeping a nightly sleep diary can significantly improve sleep quality and reduce insomnia in women through menopause, according to a study published in JAMA Internal Medicine. The University of Washington-led study also found that such phone-based cognitive behavioral therapy for insomnia significantly reduced the degree to which hot flashes, or vasomotor symptoms, interfered with daily functioning. This is good news for women who do not want to use sleeping pills or hormonal therapies to treat menopause-related insomnia and hot flashes, according to Katherine Guthrie, a biostatistician at Fred Hutchinson Cancer Research Center and a co-author of the paper. “Most women experience nighttime hot flashes and problems sleeping at some point during the menopause transition. Poor sleep leads to daytime fatigue, negative mood and reduced daytime productivity. When sleep problems become chronic, there are also a host of negative physical consequences, including increased risk for weight gain, diabetes and cardiovascular disease,” Guthrie said. 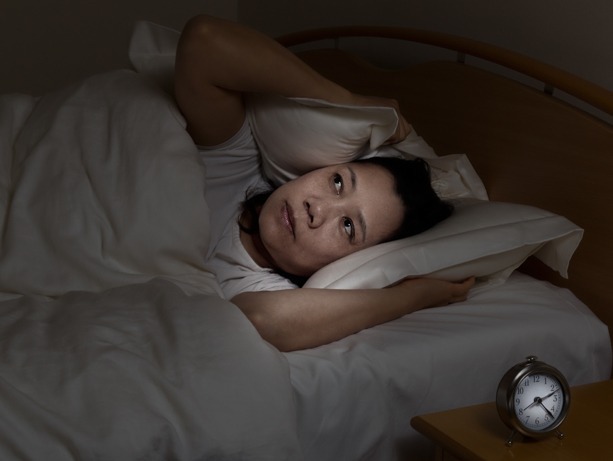 The clinical trial involved more than 100 Seattle-area women (40 to 65 years old) with moderate insomnia who experienced at least two hot flashes a day. All of the women were asked to keep diaries to document their sleep patterns throughout the study, and rated the quantity, frequency and severity of hot flashes at each assessment point. Half of the group was randomized to receive cognitive behavioral therapy that involved six phone conversations of 30 minutes or less over a span of eight weeks. Importantly, the phone calls were conducted by non-sleep specialists — a social worker and a psychologist; they had previously undergone a day of training in cognitive behavioral therapy techniques. “Since the intervention was delivered by non-sleep specialists over the phone, it potentially could be widely disseminated through primary and women’s health centers to women who do not have good access to behavioral sleep-medicine specialists or clinics,” said Susan McCurry, the study’s principal investigator. She is a clinical psychologist and research professor in the UW School of Nursing. “Such an intervention would be much less expensive to deliver than traditional, in-person cognitive behavioral therapy protocols,” she said. The goal of the therapy was to get women to the point where they consistently estimated that they were asleep at least 85 percent of the time they were in bed. To this end, they received specific sleep/wake schedules and were given guidelines designed to strengthen the association between bed and sleep. The women received information about menopause and normal sleep changes that come with age. They were instructed to create bedtime routines and an environment conducive to sleep, such as turning off electronics at least 30 minutes prior to bed, not drinking caffeine or alcohol after dinner, and keeping their bedroom a slightly lower temperature. Coaches also taught this group about “constructive worry,” a technique to practice when ruminating thoughts kept them awake at night. The other half of the women also talked to a sleep coach with the same frequency and duration, and received information about women’s health, including diet and exercise, and how they related to hot flashes and sleep quality. However, they received no instruction about cognitive strategies such as constructive worry, and coaches made no recommendations regarding sleep/wake schedules or restricting time in bed. “This intervention was supportive but very nondirective,” McCurry said. Women who received cognitive behavioral therapy experienced statistically significant, clinically meaningful, and long-term sustained improvements in sleep, compared with the other group. The women who received cognitive behavioral therapy reported that hot flashes interfered less with their daily functioning than prior to receiving such therapy, despite experiencing no change in the flashes’ frequency and severity.